I’m super happy to say that this post for The Ultimate Vegan Chocolate Cake is sponsored by World Kitchen, who I love for their affordable, non-stick baking pans. I seriously use Baker’s Secret pans all their time. They are perfect for roasting veggies, making muffins, and of course, making The Ultimate Vegan Chocolate Cake! I have been compensated monetarily and with product. Yay! Can we please just take a minute to drool over that picture? Seriously. I want to lick the screen, why oh why doesn’t my screen taste delicious and like chocolate? Thank you. I’m subtle I know. When I was a little kidlet, me and one of my best friends Katherine (hi Kat! ), would always save up our loonies (that’s Canadian slang for dollars), then when our parents weren’t looking, we would go and buy a big chocolate cake that they sold in the freezer section of the grocery store. This was a cake intended for a family. We would sneak it back to our rooms and then proceed to eat THE ENTIRE THING. (Mom, shhhhhh, don’t read that, shhhhh). We were both scrawny little things so I really don’t know how we managed to do that, but kids really seem to have a knack at consuming large amounts of sugar, don’t they? Yep, serious chocolate addicts were born. So when I say I love chocolate cake, this comes from a place of childhood sugar gluttony. When I first tasted this cake, it brought back all of those chocolate cake obsessed kid memories. This cake is rich, moist, fudgy, and super… what’s the word…chocolatey. That’s the best word to describe it really. I promise you no one will notice it’s vegan. I wouldn’t be surprised if non-vegans asked for the recipe, then you can be all cool with your sweet self, and pass it along, and wink when you tell them it’s vegan. I used these awesome red pans to make these cakes. 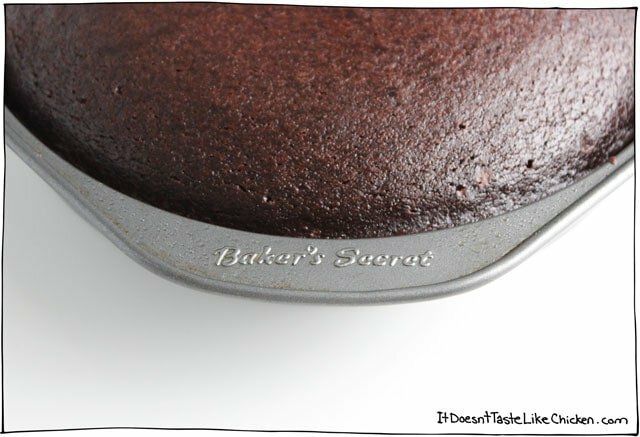 Baker’s Secret are for real my go to pans when it comes to baking. They are very affordable, but the best part is they are very non-stick, so this cake just slid right out of the pan. The last thing you want is half your cake left behind in the pan! (Trust me, been there, done that). So I so appreciate Baker’s Secret for sponsoring this post and giving me these beautiful pans so I could make the chocolate cake of my dreams. Yes, I dream about cake. 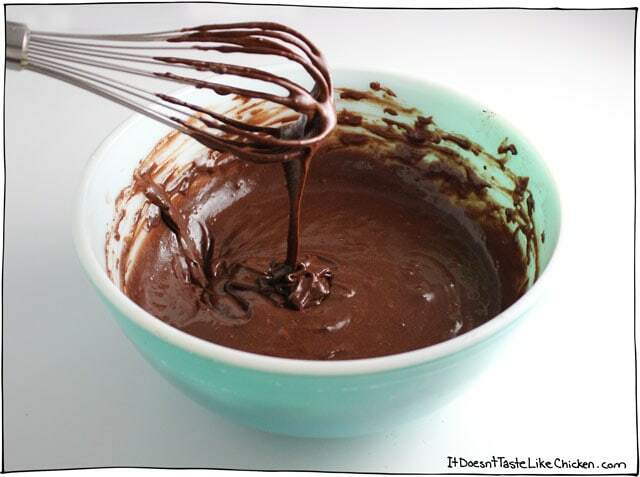 To make the Ultimate Vegan Chocolate Cake: Add all of the dry ingredients to a large bowl and whisk together. In a separate medium-sized bowl, whisk together all of the wet ingredients. Yep, there is apple cider vinegar in there. Yes, that seems weird. The reason it’s in there is to make the cakes rise and get fluffy (remember baking soda and vinegar volcanoes)? It’s a wonderful trick I picked up from Chloe Coscarelli, one of my most favourite cookbook authors. It works like a charm, and trust me, you can’t taste the vinegar at all, only delicious chocolateness. 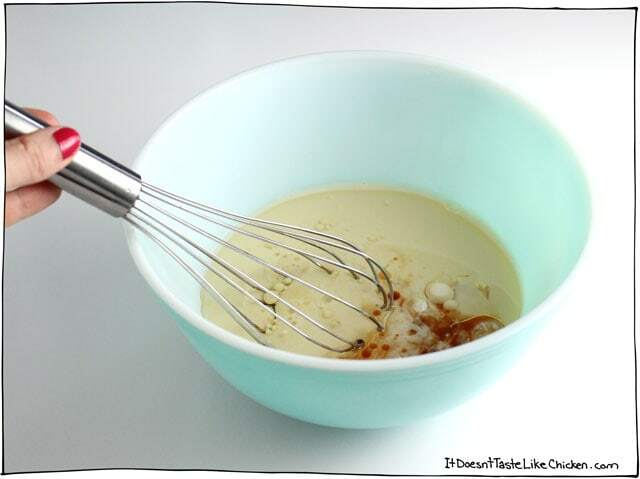 Pour the wet ingredients into the dry and whisk together until just combined. Don’t over mix. One of the many benefits of vegan baking is there are no raw eggs! So go ahead, lick the spoon (and by lick the spoon, I mean drink the batter). Divide the batter between two 8″ round cake pans. Bake until a toothpick inserted into the center of the cake comes out clean. Let the cakes cool completely before frosting. 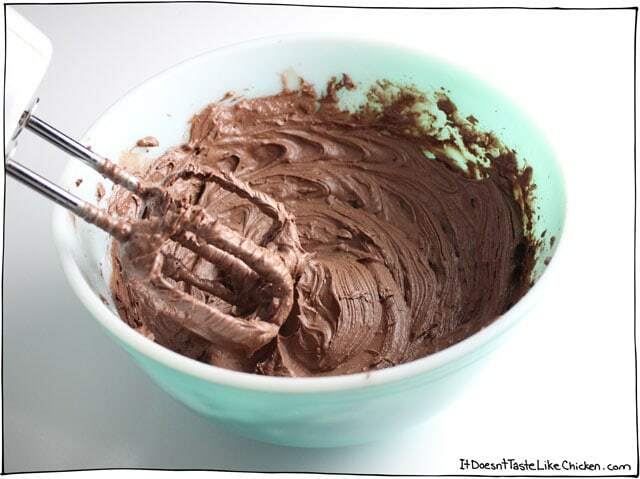 To make the vegan chocolate frosting, use a mixer to beat together all of the ingredients. If your frosting is a little too stiff, add 1 to 2 tablespoons non-dairy milk to soften it up until desired frosting texture is reached. When you are ready to frost your cakes, run a knife around the edges of the cake pans, and flip the pans over to remove the cakes. Place the first cake on your cake plate, and spread about half of frosting on top. Place the second cake on top of the frosted cake, and spread the remaining frosting on top of that cake. Add swirl patterns with your spatula to make it pretty. Store the cake in the fridge or a cool place until you are ready to serve. Prepare to have all of your chocolate needs met for life. If you're looking for the chocolate cake of your dreams, this is it. No one will even know it's vegan! To Make the Cake: Preheat your oven to 350F (180C). Prepare two 8" round baking pans by lightly greasing them, and then cutting a circle of parchment paper to fit into the bottom. In a medium bowl whisk together all of the wet ingredients. Pour the wet ingredients into the dry ingredients and mix until just combined. Don't over mix. Divide the batter into the prepared pans, then pop them in the oven. Bake for about 40 minutes until a toothpick inserted into the center comes out clean. Let the cakes cool completely before frosting. To make cupcakes: Line the wells of cupcake pans with 24 paper liners. Follow directions for the cake recipe, but then divide the batter evenly among the cupcake wells. Bake for 20 to 25 minutes until a toothpick inserted into the center comes out clean. Let cool completely before frosting. My vegan friend made this for a get together & gave me some to take home. I in turn took it to work and shared it. One of my co-workers made the recipe into cupcakes with the frosting all lovely and swirly on the top – now everyone loves it & not a clue initially that it was vegan! Thank you for all your hard work in experimenting to get the right amount of everything so that it is so delicious – its really is the best chocolate cake I’ve ever eaten! This is oddly similar to a Wacky Cake…a recipe that has probably been around since WWII. My mom used to make this all the time when I was a kid. Cool I will have to look that up! Hi Sam! I’m planning on trying out this recipe the coming weekend for my birthday, it sure sounds amazing! What I’m wondering is if you could bake the layers together and then cut them apart after – that’s how I usually roll when making layer cakes since I have a big cake pan. Do you think that would work? How would you recommend changing the baking time and temperature? Also I’m not sure if they sell apple cider vinegar in my country so I think I’ll try lemon juice instead. Can you tell me if it makes the cake taste lemony? Thanks! Hi Essi, lemon juice would be a great sub and I don’t think you will taste it too much. As for the cake pan, I would worry that the cake might not bake properly if you bake all that batter in one pan. If possible I would recommend baking in smaller pans as directed. Hope that helps! Is the calorie count for the entire 2 layer cake with frosting? No the calories are an estimate for one slice of cake. Enjoy! But that doesn’t tell me if that’s 1/8, 1/12?? How many servings in the cake? 18 servings (slices) per two layer cake with the frosting and all. Hope that helps! I made this cake today for my birthday as there was not a vegan cake shop open near me. This, was, exceptional. Everyone enjoyed it and it was the perfect balance between moist, rich and satisfying without that sick feeling I sometimes get after eating cake. Thank you very much for contributing to an awesome birthday. I made this cake last weekend, and it was on the counter for no more than a few hours before it was completely gone. I have already shared the recipe with five other friends, and I am in the process of making another one right now! I am obsessed with how fluffy and chocolatey it is. Thank you so much! A must have recipe. I just made this cake and everyone loved it, even the non vegan eaters! I also made second cake with a variation of this recipe, I replaced the almond milk with red wine and omitted the frosting, I just dusted it with powdered sugar once it cooled. It was to die for!!! Everyone loved this variation as well, so much they’ve asked me to make it again for New Years. Thanks for the recipe. Hi! I’m hoping to make this cake this week! Thank you so much for this recipe for ultimate vegan chocolate cake. This is our go to family cake recipe and even the dairy and egg eaters love it! I have started putting the rind and juice of a whole orange into the batter and it’s sooooooo good! Thank you so much for this recipe and for your whole blog so many easy and delicious recipes! Happy holidays! That’s awesome!! So very happy you love the recipe so much 🙂 Happy holidays, Natasha! PHENOMENAL CAKE!! It’s my new go-to chocolate cake recipe! So easy and so good. I can’t wait to eat it today! Thanks for a great recipe! I baked this cake today and it was very well received. I’m not sure how vegetable shortening differs from vegan butter – both are technically margarine, right? So I just used a whole cup of vegan butter for the frosting and it turned out great. I think I would prefer to use chocolate in the frosting instead of cocoa, but that’s just a preference thing. It’s a beautiful recipe and I’ll be using it again for all of my chocolate cake needs. So happy you enjoyed it so much! Vegan butter is margarine, but vegetable shortening is not, it’s vegetable fat. A bit different and it helps hold the frosting together and keep stiff even in warmer temperatures, but as you discovered you can sub ok. So happy you enjoyed! Oh, I see. I think I know approximately what to look for then. For when I bake this cake in the summer! I love your vegan recipes! Can I use white rice flour instead of all-Purpose flour? From your big fans in Japan with love. i’m not sure why but two times I’ve tried to make a vegan cake with this recipe and it just breaks apart into three big sections once i get it all layered and iced. why is this happening??? I’ve never had that happen before. It’s hard to know why without being in the kitchen with you, but that can sometimes happen when a cake isn’t cooled properly. how do you cool the cake properly? Made 4 dozen cupcakes for a dinner tonight using the icing and cake recipe here. The only change I made was using Bob’s Red Mill Gluten-free 1 to 1 flour. They were fabulous and people were even trying to snag the last few to take home! One woman said her husband thought it was the best dessert he’d ever had, and he’d had to be on his diet for 45 years. Thanks for making a whole bunch of people’s night. I made these into cupcakes using your notes on time adjustment, and they came out moist, delicious and just perfect! The top even had a slight crunch when you bite into it, just about 5-10 mins after you take it out of the oven (which goes away after a little longer), They were a hit with vegans and non-vegans alike and folks asked for the recipe, so I sent them this way. The only tweaks I made was to reduce the sugar in the cake by 1/4 cup and I added a couple of tablespoons of vegan cream cheese to the frosting, I will definitely make it again! How long do you leave it on the counter to cool? Or do you recommend putting it in the fridge to cool? Leave it on the counter to cool for a couple of hours or even overnight. Enjoy! Hello I had a quick,question, would I be able to substitute the “Light Oil, Vegetable Shortening, and Vegan Butter” in this recipe with Coconut Oil? No. The light oil needs to be liquid, coconut oil would be too heavy. In the frosting, it might be ok but you won’t have the buttery taste, and it would melt very easily. Thank you SO much for creating and sharing this recipe. My daughter is allergic to 5 of the top 8 allergens, and we love that this recipe works for us without requiring adaptation. It is SOOOO delicious, and has replaced my former family favorite sour-cream chocolate cake recipe. Hi there! I have a question about the cake ingredients. I’d like to make this for my mom’s birthday. She isn’t vegan, but she does have an egg allergy, so an egg free cake is perfect. I’m thinking about substituting a combination of coffee and buttermilk for the non-dairy milk. I love the way coffee enhances chocolate, and I have had success with buttermilk in other chocolate cake recipes. But since this recipe already includes apple cider vinegar, I’m curious if the buttermilk will be too much acid in the batter. Do you think that combination would work? Should I do regular milk instead? Use buttermilk but leave out the vinegar? Add extra leaveners to balance the acid? Thanks for your help! Hi Claire, as I’m sure you know, baking is a science so if you add coffee (an acid) and buttermilk (an acid) it could change the outcome of the recipe. I would recommend sticking to the cake recipe as written with non-dairy milk. If you want a kick of coffee, try mixing in some instant espresso powder into the frosting. Enjoy! This is the best chocolate cake I’ve ever had! My non-vegan husband raved about it. It’s definitely one that I will make again and again. Thank you so much for this recipe! I would give it 10 stars if I could. And thank you for the recipe booklet for signing up for your emails. Greetings from Sydney, Australia Sam! This chocolate cake MADE my nieces 16th birthday! A 6 months vegan, I’m challenged as to what to cook for her. I made your buffalo cauliflower wings, a vegan lasagne that you have linked to from another chef, and your amazing ultimate chocolate cake, which was absolutely the ultimate! Choc cake. Everything and absolute success! I am the best auntie ever! Can’t thank you enough! I made this recipe as cup cakes for my vegan son and his girlfriend when they came home for the weekend from university. The cakes were delicious and were hoovered up by vegans and non vegans alike! Thanks for the recipe and the hard work that must go into developing them. When can we expect the next cookbook Sam? Since my son became vegan I have bought maybe 15 vegan cookbooks but yours in the one I always return to (along with your blog) because your recipes actually work and your claims for them aren’t over exaggerated either. Aww that’s so wonderful, thrilled you enjoy my recipes so much, Mary!! 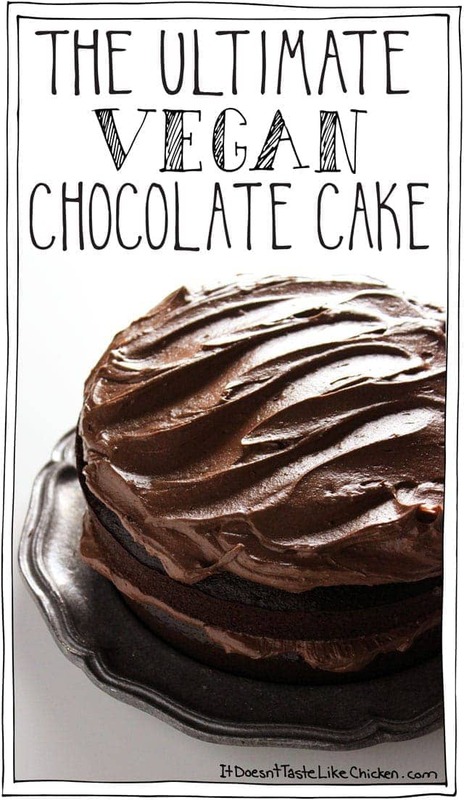 We will have to see about another book…..
Can I substitute vegetable shortening with coconut oil for the frosting? Coconut oil melts at room temperature so if you do be careful as the frosting may melt. How is it vegan? If you’re using vegetable shortening, isnt that lard? They are completely different products and vegetable shortening is completely vegan – this recipe is absolutely delicious and really simple to make too. Vegetable shortening and lard are two different ingredients. Vegetable shortening is made from plants, lard is made from animals. Can I use a 9×13 pan instead? Thanks! Sure! The baking time will be longer so keep an eye on it and do the toothpick test. Hi! Does the recipe change for an altitude of 4300 ft? This recipe looks amazing! I’m going to make it for my birthday 🙂 Just wondering though if I can substitute the white sugar for brown sugar? Brown sugar holds more moisture so it might mess up the cake texture a bit. I would stick with white. Enjoy! It says to see notes regarding the vegan shortening but there’s nothing on that in the notes. Can I make the cake without shortening? Hi Maya! Oh yes, sorry about that. I removed the notes as it was talking about a brand of shortening I liked which no longer exists. The shortening is for the frosting and is not in the cake. Enjoy! Is the time still as followed for cupcakes? Hi Ivy, here’s an article you may find helpful for this. Enjoy! I just discovered your channel! !Great looking reciepes! So I ordered your cookbook and it should be here any day! Have you ever thought about doing reciepes for vegan dog treats and food (And cats)? …….. Thanks for the great reciepes! Hi Sam, I made this cake yesterday and it is moist and delicious. I used 1 1/2 cups of sugar only and I baked it in a round cake pan. Perfect! Looking for a vegan chocolate cake recipe, I fixed on this one. I could tell you have worked at getting it all right, and as a fellow blogger I definitely appreciated your story of how you became a chocoholic. The one thing I did was I made all the measurements in grams (any recipe worth its salt gets this treatment from me) and I used coconut oil, my usual go to oil for vegan baked goods. Great! Be careful when substituting coconut oil as it is solid at room temperature which means it will make the cake a little heavier and denser. Enjoy! If I’m using a wilton dinosaur pan would i use the exact recipe or half it? I want to make for my sons birthday this weekend. So excited!! I have no idea how big that pan is but the cake batter should fill the pan to about 2/3rds full. Enjoy! I want to make this for my son’s birthday – but want a taller cake. Should I double up the recipe if I want 3 layers? This recipe makes two layers, so if you want to make 3 layers, just change the number by the servings from 2 to 3 and it will adjust all of the measurements for you. Enjoy! Oh yes, I see it now! thank you for your quick response! also one other question – does it make a difference if you use the tub earth balance spread vs the stick? I’m having trouble finding the stick here. I’ve also seen the becel vegan margarine, can that be used to substitute the stick? My go-to for baking is always Earth Balance in the tub but any vegan butter should work fine. Enjoy! This is my favorite vegan chocolate cake recipe I added fresh raspberries on top and it was a hit! Thank you! – Is it fine to use unsweetened cashew milk instead of soy or almond milk? I made this for my daughter’s birthday, and it was a huge hit! Thanks for posting! It is moist and delicious! I have read all of these rave reviews and loved your vanilla cake but this one didn’t work out for me for some reason. It wasn’t dry but it wasn’t moist either. The cake was slightly dense and didn’t really have much flavor. I am assuming it was a problem with either my flour (100% white whole wheat-says it can be used as all purpose flour in all baking) and the Trader Joe’s unsweetened cocoa I used. The cocoa wasn’t Dutch processed but I use it in other things and it is ok. Do you have any ideas? My guess is that it was the flour. Even though the whole wheat flour may work in this recipe, whole wheat is always more absorbent so it would make the cake dryer. So that’s my guess. Hope that helps! Can this be made into cupcakes and then frozen? Yep! I would freeze the cupcakes and frosting separately, then thaw and frost. Enjoy! How many minutes do I have to bake for cupcakes? And do you think the recipe for chocolate frosting will be enough to frost 24 cupcakes? 20 – 25 minutes and it will be enough for a light frosting if you want more frosting than cake you might want to double it. Haha. Enjoy! hi! i only have olive and coconut oil at home, would any of these work instead of the vegetable oil? No, you really want a neutral oil for this one! I needed to bake two vegan cakes for my son-in-law’s birthday party. I am so glad that I used this recipe for the chocolate cake. It was delicious! Everyone enjoyed it, including the non-vegans. The cake came out moist and flavorful, and the icing was perfect. I’m 100% sure that I will use this recipe many times in the future! Thanks! I didn’t have a measuring scale, so I looked for another chocolate cake recipe and found this one. I think I will now always make this one! I did another frosting and splitted the cake in half after baking and put some jam in between. Also I didn#t had baking powder neither applecider vinegar, so I used balsamico and baking soda instead and reduced the amount of salt and vinegar. I also reduced the amount of sugar and used half plantbased milk and half coffee for the wet ingredients. It was delicious and everybody liked it a lot! Very moist! If I am making 10 jumbo cupcakes how many servings do I have to plug into your recipe ? It is set at default to 2 servings. Please help I need this info by tomorrow. Thanks ! 1 serving (enough to make a 1 layer cake) makes 12 cupcakes, so maybe that? I’m not sure how big your jumbo cupcakes are! Wow, so many comments! Guess it’s not surprising since this is an amazing recipe. I have a birthday bundt cake that I have made for about 20 years. With 4 eggs, sour cream, box mix, a bar of melted semisweet chocolate.. My daughter, who has recently realized she and dairy are not the pals she thought they were, asked if I could do a dairy free cake. And I immediately thought of you. Because you have such a knack for nailing the taste and consistency of “regular” food. Well. No one even noticed. They all raved at how moist and wonderful it was. You did it again!! So, bundt cake with ganache. Another twist on delicious! And I am so happy to have a new hugely healthier version of birthday cake. THANK YOU!! That’s awesome!!! Thrilled you and everyone else loved it so much, Sara. Flattered that you thought of me! hi! I made this for my pre-school class for the end of the year, just testing out the recipe – one of my little girls is allergic to dairy. I didn’t have cake pans which surprised me as I am an avid baker, so I used cupcake tins instead. My cupcakes turned out fantastic! I kept and eye out on them and they baked through in about 28-30 minutes. My neighbor downstairs is vegan so I brought some to her! Thank you for this recipe! I’m sure my kids will love it next month! I added an extra 1/2 c of cocoa to the cake, put it in 9 inch rounds and cooked 15 minutes less. It was delicious. I’m not a great baker, but this cake was delicious! So moist and delicious! Best chocolate cake I’ve ever made (even before I went vegan). No one will know it’s vegan! I loved this recipe! Obsessed, even my dad (who’s so anti anything healthy/vegan) loved it and couldn’t tell the difference, but I had a problem when trying to take the cake out of the pan, it stuck to the bottom, even with the parchment paper, have you got any tips for that? Would a silicone pan help? I wanna do it for my birthday (Turning 25 in april and I need this cake!!!) and I want it to turn out perfect! Thanx for this recipe again!! We used raspberries too .. divine THNK YOU!!! I needed to make a vegan birthday cake for my neighbor and came across your recipe and it turned out absolutely amazing!! My whole (non-vegan) family of five loved it as well! Hello, I made this cake a week ago and it was delicious but it dried out on the edges after two days in the refrigerator. You said that you could have it in room temperature for it not to dry out but because I can’t find any vegetable shortening where I live I had to use vegan butter instead. The problem is that you said the cake was gonna melt if you have vegan butter instead in room temperature but it becomes dry in the refrigerator. Do you have any advice on how to keep it from drying out without the frosting melting? I would love to make it again but I had to throw away many chunks of the cake. Thank you for the answer in advance! Hi Anja, yes, I always store my cakes at room temperature as the fridge can dry them out. I would just recommend keeping the cake in a cooler area of your hose- not near the stove, a heat source, or in direct sunlight. Hopefully, that will help. I made this cake today but haven’t tried it yet but I used the 2 8 in pans that are 1 1/4 deep, the old time pans but had a ton of batter left. enough for about 17 cupcakes. I could have filled pans a little more but still a lot left. Are you really using 8 in pans and are they deeper than mine? Hi Terri, yes I use 8 inch baking pans. I think mine are about 2 inches deep. Do you think you could have accidentally doubled the recipe? I really like your recipes but could you maybe include metric info for the ingredients? Hi Maxi, glad you are enjoying my recipes! I don’t use metric measurements, but here is a conversion chart you should find helpful. Enjoy! I never make cakes. I am really, really bad at baking. But for some reason I was able to successfully make this cake! It was delicious! It is very rich, though, so when I make it again I’ll probably just do one layer. I plan on making this cake tomorrow and have read through the comments. I am interested in swapping out the white sugar for another sweetener. I saw someone used coconut sugar but was wondering if you had any other suggestions? Thank you for making my vegan lifestyle a little easier with your great recipes!! Hi Renee! I haven’t tried this recipe with any other type of sugar, so I don’t really have any recommendations. I hope you enjoy the recipe tho! For the frosting will it turn out good if I use coconut oil in replace of the vegan butter/margarine. I have all the ingredients for frosting but not the butter .what do you suggest to replace vegan butter with? Vegan butter will work best. You can use coconut oil, but the frosting will lack in the buttery flavour, and also coconut oil melts fairly easily. So make sure to keep the frosting and tools cold and store the cake in a cool place. Enjoy! I love this recipe so much! But I was wondering how I would go about with using cake flour instead of all-purpose? My box of cake flour says to use 1 cup plus 2 tablespoons of cake flour for every cup of all-purpose flour. Would I change anything else to ensure it still turned out as good as normal? Hi Cheyenne, I have never tried this recipe with cake flour so I can’t know for sure, but if you have all-purpose I would recommend sticking to the recipe as written. Cake flour is more tender and results in a weaker cake, meaning it may fall apart. You can read more about the different flours here and how to substitute them. Enjoy! Hey! Thanks so much! I did go ahead and use all-purpose, I was just wondering about potentially using it in the future. Thanks for the link to more info about flours, I’ll go check it out now! I made this cake today and it turned out perfectly! Is very easy to work with when frosting and it isn’t too fragile it didn’t break or crack when flipping it out of the pan. I did make some adjustments with the frosting. I doubled the frosting recipe and I also made a vegan chocolate ganache, refrigerated it and then mixed the two together and added some peanut butter and more powdered sugar. The granulated white sugar and powdered sugar I have is from Sprouts grocery store and is the store brand which is vegan. Thanks for a great recipe! Wonderful! So happy you enjoyed it, Rebecca! Could I bake this in an oven safe bowl to make a round cake for a project I’m doing? That should work fine. Just make sure to check doneness by inserting a toothpick into the center as the baking time might vary slightly. Enjoy! First, thank you for the great recipe! I’m wondering 1) where can I buy Earth Balance shortening sticks? I live in Pasadena California and we have access to Whole Foods, Sprouts Marketplace, Trader Joe’s, Vons, Ralphs, etc. 2) Should the non diary milk be unsweetened? I was planning on using unsweetened soy. Apparently, Earth Balance shortening sticks are no longer available, so I would just get whatever vegetable shortening you can get your hands on. Unsweetened or original will work fine. Enjoy! I absolutely love this cake recipe! I’m planning on making it again this thursday, but i’d like to half the recipe. What should I do with the time it’s in the oven? Should I take some minutes off? Thank you! Hi Fleur, just make a 1 layer cake instead of a 2 layer cake, and bake for the same time. Enjoy! The BEST!!!! The whole family loved it!! Vegan and all! followed the recipe exactly as written. Perfect. Waiting for it to cool in order to frost. I know it’s going to be delicious in that the batter was fabulous. The time indicated worked. So glad I found the site. Going to check some of the other items out! The best Eggless cake recipe ! I have tried many other Eggless cake recipes, but they never turned out to be good like this one. No one will believe that the cake is Eggless. My family and friends loved it. Thank you very much for the recipe! It was very yummy! Yes, use a vegan-friendly margarine (that’s what I am referring to when I say vegan butter). Enjoy! I am sorry, but this was the WORST cake I have ever made. I’m an experienced vegan baker and I followed this recipe exactly, I had to bake each pan for an hour and twenty minutes each and they were still gooey and rawish in the center. I was not even close to satisfied. I used a minimalist baker icing recipe which was ok, but I will never make this recipe again. I love your other recipes though!! Really? That’s so bizarre! This cake works perfectly for me every single time and in fact I am making it again today. Thats crazy! The batter is delicious! Mine took about 50 min to cook through and I was so excited to see it rise so high! Waiting to frost it and nomnomnom! Thank you!! So happy you love it, Trina! Wow, thats unfortunate. I have made this cake countless times since finding the recipe a few months ago. My non vegan friends say it’s the best chocolate cake they’ve ever had! (I tend to agree) I 100% give this recipe 5 stars, 10 stars even! Yay! So thrilled you love it so much, Shannon. It’s my favourite chocolate cake too (but I’m biased) haha. I have made this cake today and had the same problem, in that the top of the cake is a hard crust already after baking for more than an hour and 20 mins but the inside is gooey, not sure as I am an experienced baker and this just does not seem to work. The sugar quantity is very high as it is the same ratio to the flour is this correct. Hi there…are you Canadian and using a high gluten canadian flour? All of our all purpose flour ( I am also Canadian) has a higher gluten content (making a denser more difficult to rise cake) than American all purpose flour. It is frustrating ….might be the problem. I made the cake as cupcakes and noted that the batter was not as runny…more scoopable like muffins. Baked them for 30 minutes and they came out fine but I wonder if baking in cake pans might have been less successful….? PS I Love this website and bought the book as well! Great story Sam on becoming vegan and thanks for everything! we made this cake for our first ever all vegan Christmas dinner, we made it exactly as the recipe showed, changed nothing. It was so delicious, firm but not dry, the icing was so smooth and luscious. It’s not too sugary. It’s THE perfect cake.. We had to show our omni friends and family the recipe because they could not believe it had no eggs in it! Hi Sheena, vegetable shortening is basically just vegetable fat that is solid at room temperature so it helps the frosting hold shape and not melt. I’ve heard that Pflanzenfett is a brand that should be available to you, but if not just use more vegan butter in its place, adding less or no non-dairy milk. Store the frosted cake in a cooler location so the frosting doesn’t melt. Enjoy! So happy you enjoyed it! Hmmm it sounds like the vegetable shortening there is a little different as that shouldn’t happen at all! Next time I would start with the powdered sugar and add vegan butter until the desired consistency is reached, making sure to keep the ingredients cold. Hope that helps! This is an awesome chocolate cake recipe. My husband is the cook in the family and I am the baker. We went plant-based in February 2017 and it has been very hard for me to find vegan recipes that are as good as my non-vegan go-to’s. This recipe fits the bill – it is delicious and is just as good as non-vegan cake. I personally use my mom’s icing recipe (which just happens to be vegan without meaning to be) so I can’t vouch for the icing. Hi Mary, no the apple cider vinegar is crucial. I use it here as an egg replacer, it helps raise the cake. If I don’t get some of this cake soon……..! What about some stout or espresso… or coffee stout? 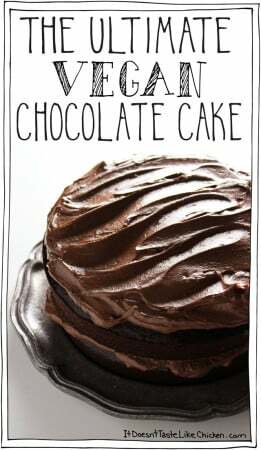 I haven’t made this cake… and I likely won’t because it has sugar in it…, but I sure do need a great vegan chocolate cake recipe. Most true lvegans do not eat sugar. Why, why, why does ths recipe have white sugar in it?! And I’m not saying I prefer agave, or honey or even molasses … the only vegan sweetner would be brown rice syrup / barley malt syrup. White sugar is processed using what’s calle d”charr” — its from animal bones. Plus only brown rice syrup or barley malt syrup do not spike insulin and all the other bad things sugar does. — It’s not only this cake recipe… so far every vegan dessert recipe I’ve found so far has white sugar or agave and white sugar… Soooooo dissappointing and so not on point. Hi Jennifer, actually, a lot of brands of white sugar are totally vegan. Using bone char to refine sugar isn’t very common anywhere other than the US as far as I know, but I do check the sugar I buy to make sure. The standard brand I use here in Canada is Redpath and they say on their site that the sugar is indeed vegan-friendly. So you just want to check the brand you’re purchasing. A helpful tip is that all organic sugar is always vegan-friendly! Honey, on the other hand, is never vegan as it comes from bees. As for the health side, no, sugar isn’t healthy and I never claimed it was. Vegan is not synonymous with health. You can live off of french fries and still be vegan. It’s up to the individual how healthy or not healthy they want to be. Hope that helps! Hi Sam, THANK YOU For this reply, as I am desperately trying to find the ultimate ways I can respect my son-in-law with outstanding vegan recipes…. and I know very little about veganism and what is what… I am so ignorant about it…. Once I thought I was appealing to his needs by making the best jello recipe I could muster…. boy did I learn THAT day! I will now shop for who carries vegan sugar in my neighborhood, Blessings! Hi Traci, I’m not gluten-free so I’m not knowledgeable in gluten-free baking. I have heard good things about Bob’s Red Mill 1 to 1, but have never tried it myself. Hope that helps! I was wondering what brand of apple cider vinegar did you use? Was it Bragg’s? This cake is so bomb it’s ridiculous. I brought it to Friendsgiving and my friend now refers to it as “The Matilda Cake.” You know the cake that the principal forces the kid to eat in the movie “Matilda”? Yeah – chocolatey and moist like that. Everyone was shocked it was vegan! My first time baking vegan and I was a little nervous, but this was dreamy. 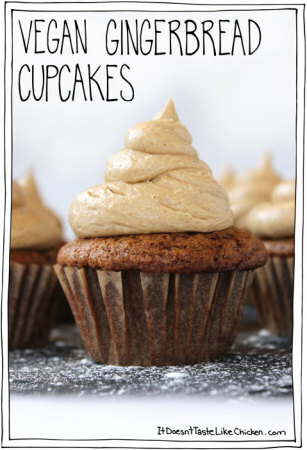 I made these tonight as cupcakes and I substituted for gluten free bob’s red mill. and almond milk. It turned out great! I am freezing them and serving them Saturday.! Thank you! Hi! I’m planning to make this as cupcakes as well! How long did you bake them? I did timed it for 20 minutes and started checking at 17 minutes. Depends how much you fill it too. Mine was 3/4. Awesome, thank you! This is my go-to chocolate cake recipe but around Halloween I made a vegan ganache icing to go with it. I ate half the cake in 2 days. I Love This Cake (and blog)!! No problem! I love the recipes here too!!!!! Oh the vegan ganache sounds yummy! Good luck! Thank you so much, Sara!! a two layer cake will equal about 24 cupcakes and they take 20 -25 minutes to bake. Enjoy! Oh thank goodness. I began reading through the comments, desperately hoping someone would say that they’d made cupcakes with this recipe. Oh oh! I bit off more than I could bake. Asked to donate vegan desserts for 100 pple, I couldn’t refuse. Can you share some bulk recipes for brownies and cake so I can use amounts for 4- 1/2 sheet pan cakes and 2- 1/2 sheet pan brownies? Or do I simply multiply amounts by how many pans I make? Hi Laura, wow! That’s a lot. I have never made this recipe in a sheet pan before. Hopefully, this article helps you. would it be possible to substitute the all purpose flour with cake and pastry flour (white)? will it change the texture of the cake? I believe I just responded to your email. 🙂 Cake flour is different than all-purpose as it will make the cakes very tender. I have never tried it myself with this recipe, it does run the risk of the cake collapsing, especially because it is a richer cake. If you want to try substituting here is a good guide. Hope that helps! Can less sugar be used than the recipe calls for? I prefer a less sweet, more cacao taste. Best cake recipe I have found! I always use it for my brother’s birthday cake, any work event which needs cake or anything else 🙂 and my dad (not vegan) is always asking if I’m going to be making another one for Christmas. Thank you so much for the recipe!! I have to disagree about not being able to taste the vinegar. I can definitely taste it. It doesn’t make it inedible, but it’s not a flavor I’d prefer in a chocolate cake. I was so surprised at how much this resembled a cake mix batter both when I put it in the oven, and when the two pans came out. It has a great texture. I’m new to this whole vegan thing, so imagine my surprise to be able to make a cake that not only doesn’t have eggs, but it also doesn’t have any egg substitute, either. Maybe when it’s been refrigerated overnight the vinegar flavor will mellow out a little. I have to wonder if it’s because I made an effort not to overmix it, that maybe the vinegar didn’t get incorporated as much as if I’d used a mixer. I wonder which of the dry ingredients could be blended with the wet ingredients using a mixer and not affect how it bakes and rises. Hi Stacey, yeah I never use egg replacers, pretty cool right? If you mix the dry ingredients well, and then the wet ingredients well, that’s all you need to do. Is it possible you have a more intense flavoured vinegar? I use apple cider because it’s milder in flavour. You shouldn’t be able to taste it at all. Hi Sam! Just a quick question. 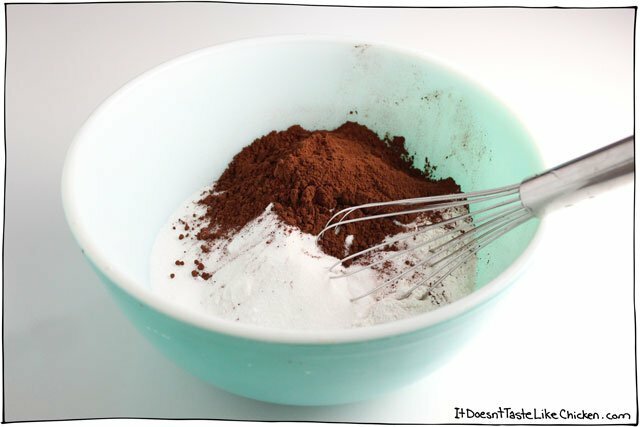 Do you use Earth Balance Sticks or Earth Balance from the tub when you make your frosting? I use the tub because that’s whats available in my store, but I am sure the sticks would work well too! Hi, thanks for sharing this recipe! This was the best cake that I have ever made and tasted!! I was little skeptic about apple cider vinegar, but was all perfect!!! I have baked this cake twice, first time straight up as is and the second time I switched half of the white sugar in the cake for brown sugar and added some raspberry preserves to the wet ingredients. I also topped it off with some fresh raspberries and mint. I’m thinking about maybe adding some liquorice powder next time……could be a nice experiment. I linked back to this recipe as a reference because it is undoubtedly the best “base” for a vegan chocolate cake I’ve found. have you tried Lakanto as a sugar substitute? It is made from Monk Fruit and has zero glycemic affect!! It’s a one to one substitute to sugar and sssssooooooooo much healthier!! I also need GF so I’ll have to substitute the flour – but it should come out just a delicious (fingers crossed). I just made this cake for my sister’s bday and while it seemed to have turned out well (we’re eating it tonight), I had a hard time baking the cake all the way through the center. Every time I tested it, it was still gooey at it’s core, so it ended up baking quite a bit longer. In turn, the edges ended up over cooking, so I had to trim the cake down. Did you have this problem or have any suggestions in case I want to use this recipe again? Hello! I wanted to let you know that this was the most tastiest, moist, and delectable vegan chocolate cake recipe…and I am not vegan. My friend (who is vegan) asked me to make a bday cake for her husband (non-vegan). The feedback I got was “you can’t tell that this is vegan”. My husband even accused me of adding milk and eggs! LOL Thank you, again…this gave my friend even more [sweet] options she didn’t think she had before. I wish I can give it 10 stars!!! I am planning on making this for my sons first birthday this weekend (Ill make a full cake to serve, and a cupcake for a smash cake) please tell me you used 100% cacao powder. Its all I can find! This cake looks SO yummy and has so many great reviews, and I wanna please all my non-vegan friends and family! Yes that will work just fine 🙂 Enjoy! Sam, you truly outdid yourself coming up with this outstanding recipe! Thank you so much for sharing it! We love, love, loved it! Will make it many times over! Thank you! Tried it and loved it! Very moist. Had to let the cake sit overnight to get the desired texture once it cooled, but well worth the wait! Non-vegan friends love it! This is the best chocolate cake recipe I’ve ever used. It’s moist, gooey yet fluffy and not too heavy! A lovely balance of rich without being indigestibly rich. I love it and I’ve made it loads of times. Thanks, Sam! I made this cake for my vegan friend’s birthday, and baked it in a 13×9 pan. It came out perfectly! I have never made anything vegan before, but I will be using this recipe again! Everyone really enjoyed it, and most said they would never have guessed it was vegan. Thanks for the wonderful recipe! Is there a way to use the following substitutions in this chocolate cake recipe? Hi Sandy, I really don’t know as I haven’t tested any of those ingredients with this recipe. Sorry I can’t be more help! I really need this recipe in metric or imperial measures. I’ve googled it and no two websites say the same. It sounds delicious and I must made it for my daughter’s birthday. I really need this recipe in metric or imperial measurements! Have researched and no two website says the same! Please help me, I need to make this for my daughter’s birthday. Hi, I just made this cake for a bunch of non-vegans and it was a huge hit. How delicious and perfect. Really. When i was tasting the frosting I thought it was a little bland but after it set and chilled and i ate it with the cake it was truly perfect. Thank you. I really impressed everyone with such as excellent cake that was also vegan. I made the cake again for my National Night Out party and everyone loved it! No need to even tell folks it is vegan. Hi, I made another cake with gluten-free flour and it was exquisite again! Thank you! I only have a 9″ springform. Any substitutions I need to make? 9″ pan should be fine, the baking time may be slightly different so keep an eye on it, and check with a toothpick to see if it is done. Because you are using a springform, make sure to line the pan with foil, as the batter is very runny and may leak through the pan. Enjoy! This looks so yummy! Do you think using Silk dark chocolate almond milk would be okay? I don’t have any regular almond milk on hand. Thanks in advance! At this moment I am half way through baking this cake. First time making vegan cake and was worried when I put the batter into the 8 ” baking pans. I was not sure how high the dough would rise. Well I just checked and the batter is dripping out of both pans all over the oven! I will finish cooking and taste test before I make further comments. Oh no! Sorry to hear that, Chris. I’ve never had that happen before. I hope you love the taste of it at least! This is the first time I baked a cake that tastes very good! I am a vegan and would like to give in to my sweet tooth’s desire for cakes by making my own so that I am sure it’s vegan. My son used to tell me that I should admit it that baking is not just for me because every time I would ask him to take a slice of my baked goodies he would laugh and say it doesn’t taste like cake or muffin. For this recipe of yours, I used muscovado sugar instead of white. Thank you so much for selflessly sharing your recipe. I ate to my heart’s delight and I even shared it with some friends who liked it much as I did! Hi there, planning to make cupcakes with your recipe! Was wondering, do you use raw cacao or Dutch processed? Thanks! I’ve found either work well, the cake may raise a little more or less, but there isn’t too much difference. I believe the last time I made it I used dutch processed cocoa. Hello! You say not to over mix. Does this mean you just mixed it with a spoon or did you use electric beaters to mix it? I have it in the oven right now and am worried it didn’t get mixed up enough. The lumps were gone, but I just used a large spoon and did t get out my electric beater? Hoping I didn’t mess up! 🙂 thanks! Just use a spoon or spatula, and small lumps are totally fine. If you over mix it, you risk killing all of the bubbles so it won’t rise properly. I’m sure it will turn out great! Hi there… what can be used instead of apple cider vinegar? Apple cider vinegar is the best for this recipe, but in a pinch you can use lemon juice. I have made this cake twice now and it is absolutely perfect and my family and I agree that this vegan cake is better than other non-vegan cake recipes. It is more moist, smooth and does not go stale. I do want to share my small changes, in case others would be interested. I use grapeseed oil which gives it the smooth, rich flavor. And for the non-dairy milk I use this fabulous brand of macadamia milk from Milkadamia. It is the closest to cow’s milk in texture, color and taste. Thank you soooooo much for the great recipe. It is by far the best vegan cake I ever tasted. Every time I tried to bake vegan before the result was very dens and hard and dry. I made the cake for my husbands birthday and he loved it. I only had one problem: I used spring forms and that went really well but the top of the cakes cracked open and I had to cut the top off to decorate it. Do you have any idea as to why this could have happened and what I could do, to prevent it? I had my oven set to 180 degrees with air circulation. If I don’t have almond milk can I just use….water?? Theoretically, it should work (I’ve never tested it). You may lose a little taste and creaminess however. I would stick to using a soy or almond milk if possible. Enjoy! Best chocolate cake ever. I’ve probably made this cake over 40 times for family and friends. We even have a joke about chocolate cake Friday at work and my staff and I make up reasons to have a party to make this cake. Delicious cake, moist and decadent. When done right this cake turns out to be the best vegan chocolate cake you will taste. 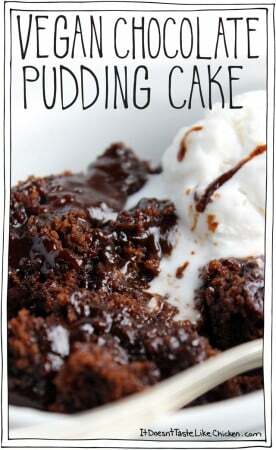 Hiya, was just wondering if it would be okay to make this a day in advance, or if it’s best eaten on the day of baking? It looks delicious! Hi Camilla! This cake holds up very well, and would be just fine to make it a day in advance. I actually usually bake the cakes the day before, and frost it the next day as I tend to do my baking at night. Enjoy! Is the sugar there for bulk as well as sweetness? I’d like to use half the amount of sugar and sub the rest with “smart sugar” (in Australia – it’s half sugar, half stevia). Either way looking forward to making it for a friend. I’ve never tried using stevia, so I’m not sure of the results, but hopefully, this article will help you. Thanks for that, I also forgot to ask, Do you think this cake would hold up under fondant? I’m going to make it regardless and will frost it if it won’t, I’d like to try with fondant. Thanks for your whole website actually, It’s great. I gave this recipe a run out for a vegan cake and changed cocoa for carob too and I am impressed.. thank you for the guidance it looks very sumptuous and is super sweet.. interestingly I used Hemp oil in the mixture which created a sort of marbled glaze on top too.. looks good tasted rich.. a good birthday cake. So happy you enjoyed it, Jon, and interesting about the hemp oil! Thanks for sharing this amazing recipe!! Thanks for your replay and the recommendation! I will try with something similar to that flour because where I live I can’t find that one and if it works I will let you know. Our favorite gluten free flour is Better Batter. You can order online on Amazon or directly at their website BetterBatter.org. Bob’s Red Mill is often too heavy for baking. Hi There my friend wants a vegan cake for her wedding. Can you tell me if the cake rises well because it will be used for the tires of the wedding cake. Could I use margarine instead of light oil in the wet ingredients? And if yes, in what proportion? Hi Cindy, I haven’t tried it myself so I can’t be sure, but I wouldn’t recommend it. Oil keeps the cake fluffy and moist. I’m not sure how margarine would react. Made this cake for my brothers birthday last week and everybody loved it and the non vegan family members said it’s there new favourite cake, so much so that I’ve been asked to make another today just because. Yes, but you would taste the olive oil, which I don’t think would be very yummy. Thank you for answering, I’ll figure something out! I’ve made this cake and it is delicious, a huge hit! I’m wondering how to make this cake as a vanilla cake. Removing the cup of cocoa powder will definitely change the texture. Any ideas? Thanks! Hi Katrina, just use my vanilla cupcake recipe. If you don’t want cupcakes, pour into a 9″ cake pan and bake 35 to 40 mins until a toothpick inserted into the center comes out clean. The recipe will make a 1 layer cake, so feel free to double for a 2 layer cake. I have made this cake twice over the last year. Both times it turned out perfect! My wife is very picky about her chocolate cake and she said I nailed it and hit a homerun. Moist and light. Thanks for the great recipe ! I am new to vegan baking but i’m going to try baking this cake tomo morning for my husband’s birthday the next day ! Quick question- have u tried this with almond milk before ? I know your recipe says any non-dairy milk ( and u used soy milk ) but one of our friends is soy allergic so I am hoping this can look and taste as good with the almond milk…let me know ? Also, I am just hoping to make a one- layer cake – and i am going to half the recipe , which i hope is fine and I am also hoping to use my springfoam pan which is the only round pan i have on hand- do u think it will be ok? Cos one of your reviewers/ commenters mentioned it didn’t work with a springfoam pan! Yes, almond milk will work perfectly! You can definitely half the recipe to make one layer. The problem with a spring form pan is that the batter is very thin so it will leak out, so I would line the pan with tin foil so there are no holes or cracks and it should be just fine. Maybe put a baking tray underneath just in case. Enjoy!! Been wanting to write back but didn’t get to it – thanks for the amazing cake recipe !! The cake turned out to be a big hit with my hubby and our friends and those who didn’t know couldn’t tell it was vegan. I made both a single layer cake and cupcakes and both were super moist and delicious. Hi Vidhya, yeah… that’s why I prefer the half shortening half vegan butter combo as it really holds up the best. I don’t think I’ve ever tried the soy free Earth Balance, so maybe it has a different texture. I think basically all grocery stores carry vegetable shortening (Crisco brand usually), so next time I recommend trying that. Glad you enjoyed the cake at least! For future reference and those who absolutely can’t find vegetable shortening, I found that coconut oil is an OK alternative (just make sure to keep the cake properly cooled during summer). It’s not ideal, but better than nothing, anyway. The earth balance butter that is best for buttercream frosting is the sticks of butter! I used the earth balance butter in the tubs before and it didn’t work out for me either. Hope this helps! How many ml of glass do you use? Hi! I’m sorry, I don’t understand the question. Can you explain more? Can you tell me the amount of a cup in mililiter? For example- 1 cup is a 200 or 250 mililiters? This chart should help you out. Enjoy! Thank you so much! So i believe it suppose to be 1 cup= 240 mililiters (140 gram flour in a cup), right? Glad I can help! I do all of my measurements in cups and spoons so I don’t have the weight calculated of things. Do you think it would be alright to spread a vegan pistachio pudding between the two cake layers as a filling? I’m thinking if I spread a thin layer of the chocolate frosting on top of the bottom cake and a thin layer on the bottom of the top cake, it may prevent the pudding from soaking into either layer? Any thoughts or suggestions? I’ve never done it myself, but I did a bit of research, and it seems that lots of people have used pudding as a filling in cake with success. So I think it will work just fine. Enjoy! I just made this cake and it was way too much cake batter? It made the biggest mess in my oven, I thought for sure I would have seen other with the same problem but looks like no one has had any problems with it. What did I do wrong? I used two 8 inch round pans, divided the batter and it went to about 1/4 of an inch from the top when I filled the batter, I just thought it would not be rising much so I didn’t really think about it until I started smelling burnt smell while cooking, when I peeked it was the worst mess I’ve ever seen. It had 15 more minutes so I just let it cook, couldn’t have gotten messier. When I pulled it out it seemed to be done so we’ll see how it tastes later. The frosting looks good. Wish me luck! Did you use dutch process or natural cocoa? They react differently with baking powder. I made this cake and it was DELISH, but since I had so much batter too, I used a Bundt pan. Difficult to get out and needed to cook for 65 minutes. It rose to the top of the bundt, I used dutch process cocoa. Hi! Will you please let me know if it would be possible to make this into cupcakes, including any suggested modifications on oven temperature and cooking time? Thank you! Planning to make this for a couple of friends who don’t eat eggs. One quick question here – can this be baked in a 9×13 pan. I don’t have the pans specified in the recipe and I don’t want to look for another recipe. This one looks perfect 🙂 pls tell if this’ll work. Thank you. Yes, it will work just fine. It may take a little longer to bake so just keep an eye on it and do the toothpick test. Enjoy! Woohoo! So happy it went over so well! Your description sounds so good it makes me want to make cake right now! I love how simple the recipe is! I made this for my mom for her birthday earlier this week. She’s vegan and gluten free, so I made a few adjustments, but the final product was rich, moist and fudgey. I used a mix of bobs red mill 1 to 1 and almond meal (about 1/2 cup for moisture) to replace the flour and doubled the baking powder. It turned out great! A lot of vegan cakes call for ground flax seeds (which I’m not a fan of) or apple sauce, but I’m very happy this one did not. Thank you! 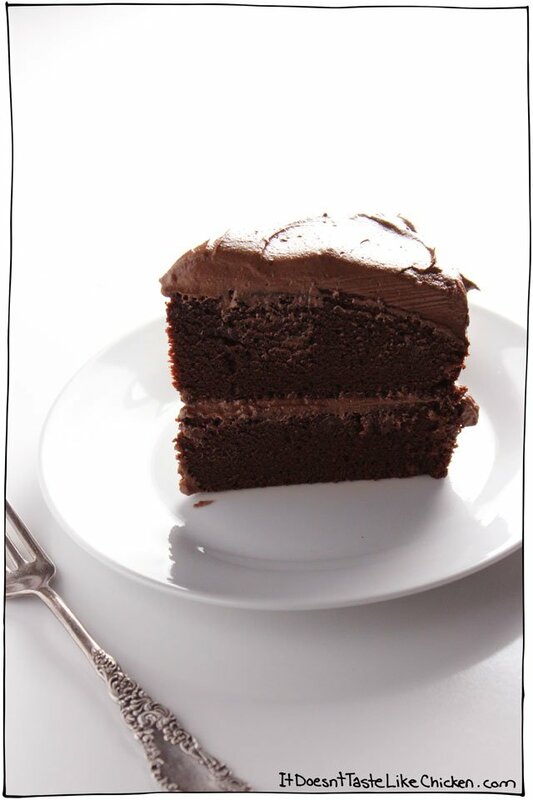 Hi – This is my favorite chocolate cake recipe! I am trying to make a red wine chocolate cake and wanted to know if you think I could swap out some of the liquid for a red wine? Appreciate your thoughts! Hmmmmmm… Not sure about this one. I am sure you could sub some of the non-dairy milk for wine, but the wine will also be acidic which will react with the baking soda, so you may have to reduce or omit the apple cider vinegar. I don’t know if it will make the cake rise the same tho. It would require a bit of testing. Hope that helps a little! What type of cocao powder did you use? My son has a dairy allergy and I never used cocoa powder, so I don’t know which one is a trusting brand. Hi, what about not using the shortening and all butter for the frosting. That would work? Yes, but the vegan butter will be softer, so maybe avoid adding non-dairy milk if needed, and keep the cake stored in a cool place so that it doesn’t melt. Enjoy! Hi! I want to make the cake and I want one layer to be vanilla/yellow cake and the other to be chocolate, could I make the recipe but only but cocoa powder in half? Thanks! 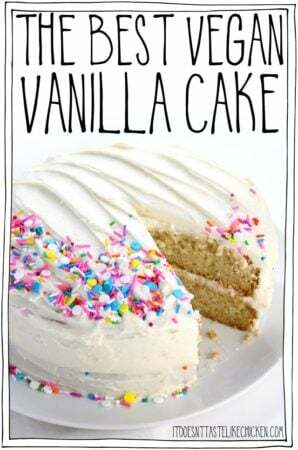 Use my Vanilla Cupcake recipe for the vanilla layer. The recipe will make enough for a 9″ layer cake, and just bake a little longer, for 35–40 minutes. Would love to try your cake! However, they do not sell vegetable shortening where I live ( or in this country) , can you substitute it for anything? Maybe coconut butter? Or just vegan butter? Thanks for great recipes! You can use more vegan butter. The frosting will likely be a little softer than with the vegetable shortening, so I would keep it in a cool place so that it doesn’t melt. Enjoy! I have no vegan butter can i use just shortening?? Do you think I can replace the white sugar with maple syrup? No that isn’t an easy switch since maple syrup is liquid and will affect the texture of the cake and the way it raises. Hope that helps! Hi Sam! I really would love to make this cake (who would’t?!) but I do not have apple cider vinegar on hand. Do you know of any substitutes that would work? Thank you so much! Lemon juice or plain vinegar would work technically, but you might taste them a little. Enjoy! Hi! Could you please tell me the difference between vegetable butter and shortening? Vegan butter is a margarine made without any dairy. My favourite is Earth Balance Buttery Spread which tastes just like traditional butter. Vegetable shortening is often used in baking, is solid at room temperature and has little to no flavour. A common brand is Crisco. Hope that helps! Can you just use 1 cup of vegan butter instead of the shortening? I want to get this but don’t have any shortening…!! Thanks for sharing this recipe though!!! You can, but the frosting will be a little softer and meltier. So I would add little to no non-dairy milk to the frosting, and make sure to store the cake in a cool place so that it doesn’t melt. Enjoy! OMG! I just made this cake and it is so easy to make and so delicious. Fantastic recipe and cake! I’m new to gluten, egg and dairy free due to intolerances, so it was great when it turned out and tasted even better. Thank you. So happy you loved it Kelly! I tried this recipe and it is the best vegan chocolate cake I have tried! Easy to make too. This was an impromptu baking and I only had less than 1.5 hours to make this recipe. For frosting I made vegan choco ganache instead because I didn’t have the ingredients required. This was for a birthday and everyone raved about it. I am amazed too! Thank you for sharing! I check out your vegan cheese recipe and I am going to try it. It looks easy with minimal ingredients. Will keep you posted thank you! Have a great day! The last time I commented, I hadn’t made the cake yet. Your recipe is now my go-to! I had a bit of an accident trying to use a springform for the first time….flame spurts in the oven kind of accident, lol. So now I make cupcakes, but don’t change a thing (well, I accidentally added an extra tbsp of vanilla this time – should be alright though). Tank you so much for this recipe! This is the favorite cake for my 2 years old doughtier. She had it for her birth day and when we asked here about a Christmas present she wants “a birthday day cake”. We love this recipe so we will do it again. And we ask her about some thing else and she said “an other birth day cake!! so she is having two! That’s adorable!!!! Thank you so much for sharing that story! 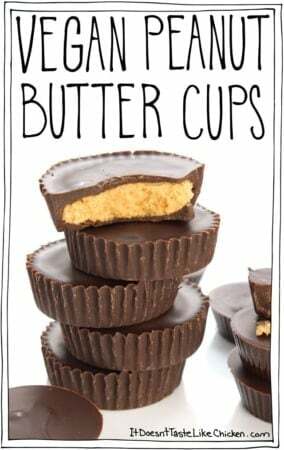 I love this recipe, however I found there was quite a lot of liquid so I used 2 and 1/3 cup of milk and 1/3 cup of oil and it worked really well. I also wanted to make a chocolate orange cake so I switched the vanilla for 2 tsp of orange essence and the juice and zest of one orange and they have come out so well!!!! Now to make another two and stack and ice them. Thanks for this recipe, it’s going to be a fave!!! Glad you enjoyed it and were able to make it your own 🙂 Orange sounds fabulous! I was wondering if you had an opinion about using coconut milk (separated) and whipping it, adding cocoa powder and powdered sugar for a different type of topping? I am not really big on shortening (or even butter cream frostings when I used to eat regular cake). Thanks for the recipe. Yes, I think you could make my Vegan Coconut Whipped Cream and mix in cocoa to taste. The frosting will be a little softer, and you will likely have to keep the cake refrigerated. Enjoy! Hi! I know not to tamper with any ingredient that affects the structure of the cake such as sugar, but this recipe seems quite high in sugar when I compare it to the amount of flour (and compared to other recipes I use which are often about 1c flour to 1/2c sugar). This cake isn’t overly sweet, so I think reducing the sugar would make it taste bitter. Feel free to try it, but I personally wouldn’t recommend it. Enjoy! It made it a bit soft and dense due to the lack of holes in the cake, so it had a slight fudgy or pudding like texture however it was amazing heated up and served with custard (egg/dairy free also) as if it were a chocolate pudding. I thought it seemed a lot of sugar so I used 2 cups instead of 2.5 and it’s worked fine! I think you could easily half the sugar without noticing much, especially if you ice the cake! Can I use canola oil or more vegan butter to replace the earth balance shortening sticks in the frosting? I cannot find the shortening sticks. You can use any kind of vegetable shortening (it can be found in any grocery store). Or more vegan butter would work, but it will be softer. So avoid adding any non-dairy milk unless needed, and make sure to keep the vegan butter cold. Once frosted, store the place in a cool place so the frosting doesn’t melt. Enjoy! Would you then frost the cake and freeze it? How do I do that so the frosting does not stick to the plastic wrap? Can I make the cake and freeze it and then just ice the cake the day before I am serving it? Absolutely! Let it cool completely, then wrap it with plastic wrap, then pop it in a sealable bag for extra protection and to avoid frostbite. The frosting freezes beautifully as well. Enjoy! I made this cake and I am in loooooooooove!!! I am going to be making it all the time now…. I just wanted to know, how long you think it will last in the fridge? Because I love it but I will get so fat if I have to eat it all too quickly!!! Lol. Definitely found my soul mate! Thanks for the info, I just made it again with half of the ingredients and it’s much better for me but I will probably just keep making it with the whole amounts and give half away, so i can be happy and so can someone else!!! 🙂 🙂 🙂 Thank youuuu!!!!! I made this as cupcakes/muffins at 180 degrees C and it made quite a lot- 24+ cupcakes. It was perfect and melted some vegan chocolate, added syrup and drizzled on top. My non-vegan friends loved it as it was for someone’s birthday. I recenly made this cake and i loved it! In fact i loved it so much ive been thinking on ways to alter it and make different flavored cakes out of it, so for that i have a question; would it be possible to completely avoid the cocoa powder to make a vanilla cake instead or is the cocoa powder crucial to the texture of the cake? 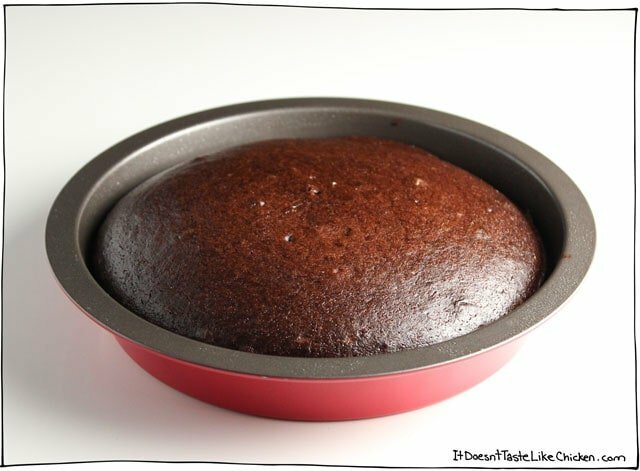 If you want a cake shape (instead of cupcakes), just pour into a 8″ round cake pan and bake for about 35 to 40 minutes, until a toothpick inserted into the center comes out clean. 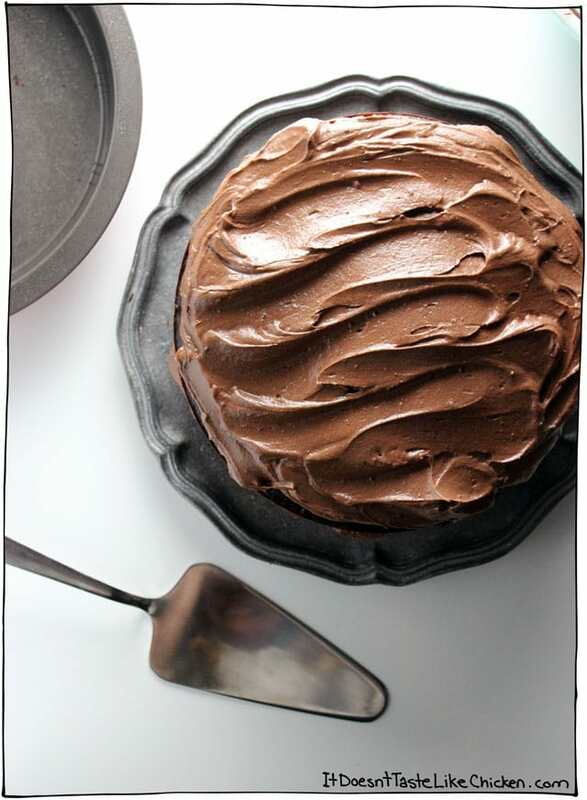 For a two layer cake, just double the recipe and pour into two 8″ round cake pans. Enjoy! Hello! I just found your recipe on and it seems delicious. I just want to ask you some questions. First thing first, is olive oil good as well for this recipe? Because you said “light oils” and I’m not really sure about it. In case I can’t use olive oil, is a chia egg or a mashed banana good as well? Should I sift the dry ingredients? Olive oil would work technically, but olive oil is strong in flavour so you will likely taste it, which I think would taste pretty bad. I recommend using vegetable oil, canola oil, peanut oil, or safflower oil. Chia or banana will not work. No need to sift your ingredients, just follow along with the recipe just as it’s written and you will be good to go! I hope you and your family enjoy it! Can I use refined coconut butter instead of vegan butter ? 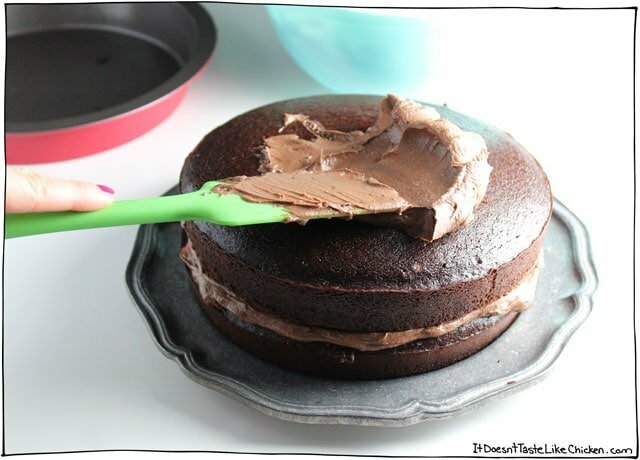 It should work ok in the frosting, but will melt easily, so make sure to store your cake in a cool place. The frosting might also lack a bit in that buttery flavour, but should still taste pretty sweet. I’ve made this twice already ( for myself lol) and it’s divine. 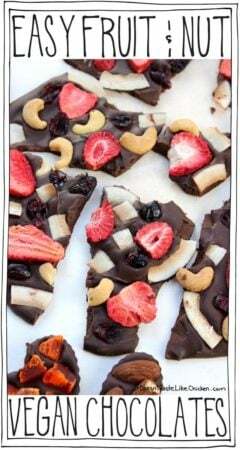 But I want to make this for a friend however, she can’t have gluten. Is this recipe gluten free? Or is there a way to make it gluten free for my friend? So happy you love the cake! This cake definitely contains gluten because it is made with wheat flour. I’m afraid gluten free baking is a different beast. I’ve heard good things about this flour blend from Bob’s Red Mill. If you give it a try I would test 1/2 or even 1/4 of the recipe first to see how it turns out. Hope that helps! Yay! So happy you loved the cake Iris and didn’t give up on finding a fab vegan cake recipe. That frosting sounds divine! Very keen to make this lovely looking cake. As I’m in the UK, though, any chance of the equivalent amounts… ie how much (in ounces or grammes) is a cup? Hopefully this chart will help you convert. I know one of my followers ended up purchasing US cup measuring tools so he could easily make any recipe. Might be an idea if you plan on making more recipes 🙂 Hope that helps! I have used metric cups instead of imperial and it works out fine, it is just ratios after all. Can I use coconut oil in place of canola vegtable oil in the wet ingredients? Because coconut oil becomes solid at room temperature, it is much to heavy for this cake and won’t work with the texture. Canola, vegetable or safflower oil will work best. Made this cake today for a charity event tomorrow and the cake turned out great; I don’t like soy so ai used unsweetened coconut milk instead. I did find the frosting recipe to have too much shortening in proportion to the amount of powered sugar so I added a half cup more of sifted powdered sugar and two tablespoon more chocolate powder. Result was a good, easy to spread frosting. I decorated the cake by covering the sides with sliced almonds. So happy you loved it Carol! Yes, I have noticed some shortening brands are softer and more wet than others so it can vary a bit. So happy it tuned out for you and the almond decorations sound lovely! My chocolate-loving granddaughter will be 3 and asked, “Grandma, can you make me a PINK cake?” I know she will love your chocolate cake, but how can I make a vegan frosting that I can tint pink? Can I make your frosting without the 1/4 cup of cocoa? Thanks! Pink cake she requested, and pink cake she will receive! Haha. 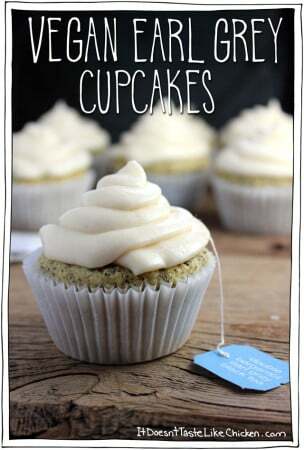 Try making the vanilla frosting from my recipe for The Best Vegan Vanilla Cupcakes. You will need to double it to make enough for a two layer cake. Then just add drops of food colouring to reach your desired colour. I hope she enjoys the cake! I love your recipes and thank you for sharing. Please read up on canola oil. It is not a healthy oil. Neither is vegetable oil. Coconut sugar is healthier than refined white sugar, consumption of which can cause diabetes. I understand you don’t want the readers of your blogs to have to hunt down hard to find ingredients. Coconut sugar can be ordered in bulk online. Yes it is expensive but it is super delicious and it is worth using to preserve one’s health. Thank you.